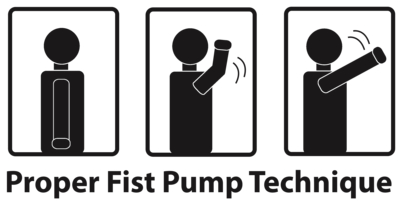 A lot of people ask me “Bro, how do you get such a massive fist pump?” Well let me tell you, it’s not easy. It takes lots more than curls and incline bench. For an effective fist pump you need to rapidly accelerate and then decelerate the fist. You can speed up training by using a medicine ball with a partner as taught here by Eric Cressey. Hopefully this will help all you guys get the most fist pump that your genetics will allow. It seems very simple, but it’s vitally important to not only sit down and track these numbers, but to use them to improve your site and overall marketing approach. A lot of people seem to be doing the right things. They know they’re supposed to use twitter or have a blog, but they don’t know how it all fits together. Social media drives traffic. By using real data to measure and follow this traffic, you can make improvements systematically rather than haphazardly. How do you go from twitter to a sale? Consider impressions or more importantly potential impressions as the sum of all twitter followers, facebook friends, google search results, or ads displayed, as a function of either time or posts. So when you send a daily link out on twitter that says “read about my cool blog post here” and you have 1000 followers, that’s 1000 potential impressions. By increasing number of impressions, through either posting more, finding more followers, or SEO you can get your links in front of more people. For every post you’ll have a number of clicks. So perhaps 100 out of those 1000 followers click your link. This will be a really low number by traditional standards because not everyone who follows you on twitter is going to see each of your links. There’s so much traffic on twitter that any given post will get lost in the mass of tweets. Also, there will be a bit of an error rate between clicks reported by su.pr or whatever url shortener you use and clicks reported by your blog. A good chunk of clicks will be from bots spidering your links. This doesn’t matter for our formula as it will be consistent, but it’s good to recognize when all your numbers either don’t jive or they look higher than expected. What’s critical about CTR is that it can be manipulated. A significant improvement in your CTR can be gained by increasing the quality of your tweets. It’s much easier to double your click through rate than it is to double your number of impressions. Usually this is done by posting something more controversial, taking a weird stance on an issue, or simply posting something that’s more relevant and popular. For example I wrote an article on how increasing population density has a greater effect on the environment than any amount of recycling can make up for. You could send a tweet that says “Population density and it’s effects on the environment su.pr/abcd,” or you could post “Save a tree buy a condom su.pr/abcd.” The second post get’s almost a 100% CTR because everyone clicks it, then everyone retweets it. By tracking number of clicks or click through rate you can get a better feel for what style get’s more results. In this example we’re calling clicks as people arriving at our web page or blog. Su.pr or your url shortener should tell you how many people are getting to your site and where they come from. This is important because it tells you what channel is most effective. If you are getting 90% of your users from digg instead of twitter, then spend more time on digg, or fix whatever is wrong with twitter. Next google analytics will tell you what your bounce rate is. This is the % of people who go to the site and then immediately hit the back button or close the window. Improving the speed and look of your website decreases your bounce rate and therefore increases sales. This isn’t directly placed in the formula, but bounce rate effects conversion rate. Conversion rate is the ratio of clicks to sales. Whether it’s get people in the door to our brick and mortar, or sell books online, the ultimate goal is getting paid. So of those 100 clicks, perhaps one results in a sale. Conversion rate is important because it can also be manipulated. By tracking conversion rate, and then split testing changes to our website, we can systematically improve conversion rate. So changing the look of the website may reduce our bounce rate, so more people read our content and buy our stuff. By changing the location or size of a banner, we may make more sales. This is all done with google website optimizer. You can run extremely complex tests and google website optimizer will tell you what works best. Generally simplifying your layout results in more sales. So the more you think about segmenting and then driving a customer to your product with as little distraction as possible, the more they buy, the more they sign up. Fewer choices usually results in more sales. Once you have a baseline for each of these it tells you a lot of important information. So in our example above we can actually calculate the value of a single twitter follower or impression. 1000 followers * 10% CTR * 1% conversion rate * $20 DVD = $20. So a single follower is worth $20/1000 or $0.02 per post. This gives you a budget to spend on acquiring more followers. The same principle applies for ad impressions. If you are running a pay per click program and you track your conversion rate of that program to be 1%, then you know you can only spend 2 cents per click to break even. With all this comes a more effective approach for writing, maintaining your blog, etc. Each post has a corresponding click through rate and potentially a conversion rate. As you get better at writing you can see what results in sales, what results in more clicks, etc. By improving any piece of the formula, you increase sales.